With over one hundred species categorized into twenty nine genera, the art of skimmer dragonfly identification can be a difficult task to manage. 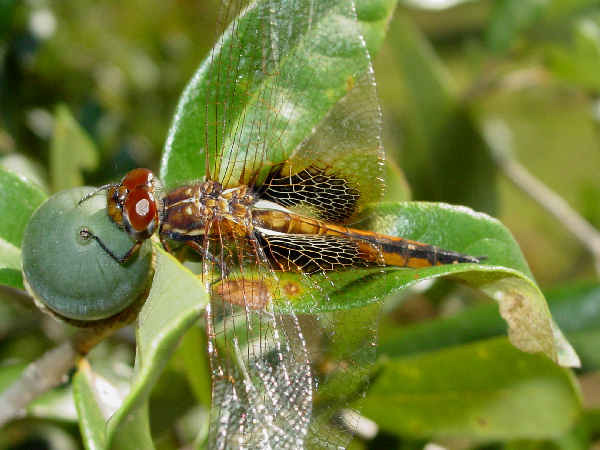 The task becomes simpler by breaking the initial dragonfly identification process into a four part examination of the color and arrangement of the markings on the face, thorax, abdomen and wings. All four physical features represent field identification clues that need to be considered together. Because color tends to immediately catch the eye, it’s a great way to begin the identification process. Libellulidae males tend to be more colorful than the females, with many Libellulidae females showing some shade of brown abdomen. The meadowhawk group, for example, consists of red, or off color red, males and brown or off color brown females. 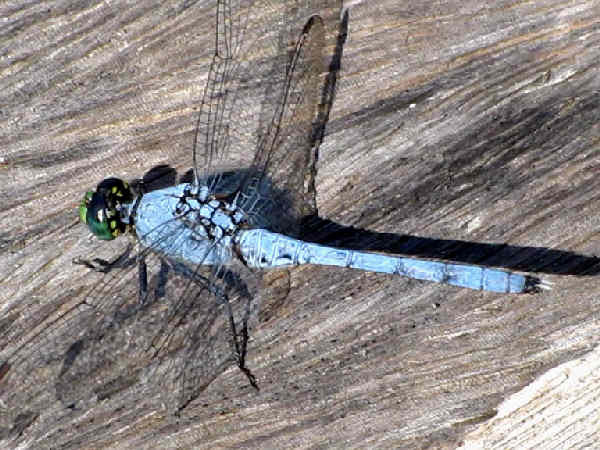 Blue, another popular dragonfly color, also causes identification confusion. 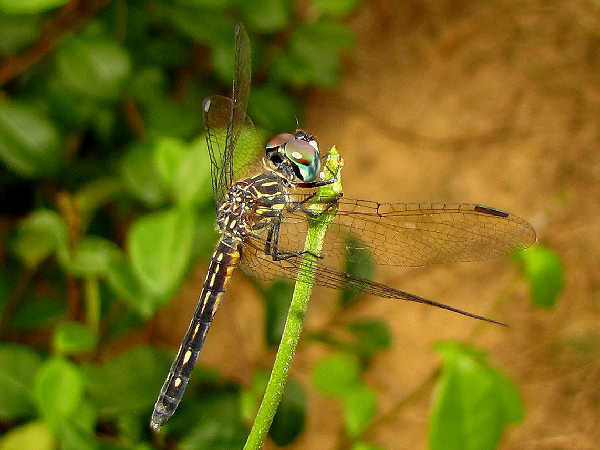 Both the male Blue Dasher and male Western Pondhawk, for example, have blue abdomens. Here’s a starting guide useful as basic identifiation starting point for skimmer dragonflies. Press the button to discover additional information about other types of dragoflies. Approximately one-fifth (20%) of North American skimmers (family Libellulidae) belong to the genus Libellula, a diverse and colorful genus of dragonflies that inhabit ponds, lakes and other slow water bodies, flying from early spring through late fall. Three different species, Four-spotted Skimmers (Libellula quadrimaculata), Eight-spotted Skimmers (Libellula forensis), Twelve-spotted Skimmer (Libellula pulchella), use the number of wing spots as their naming convention. Two dark wing patches on the Widow Skimmer (Libellula luctuosa) technically qualifies its being called the two-spotted skimmer. Second only to the Libellula genus in number of species, meadowhawk dragonflies (Genus Sympetrum) extend their range across North America. 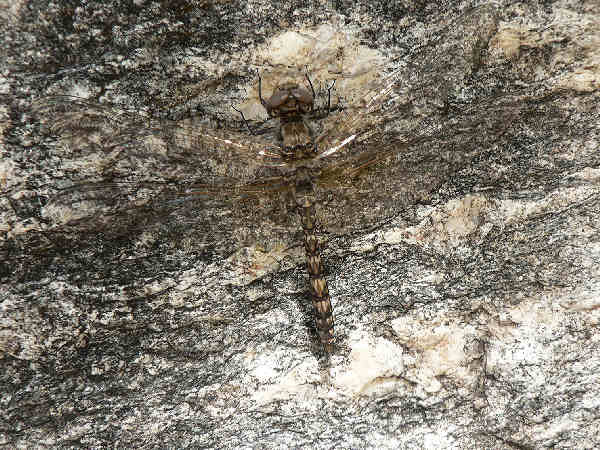 Like the Libellula, they inhabit pond and still water areas, often perching on the ground or on local flora. Their propensity for perching translates into their being cooperative photo and video subjects. Physically, the male’s red body serves as the initial field identification clue. Females, always close by, usually have brown bodies, although some have some red coloration. Depending on the count, North America hosts approximately fourteen different Meadowhawk species. From top to bottom, the first image shows the Cardinal Meadowhawk (Sympetrum illotum),known for its red nose, thorax and abdomen. 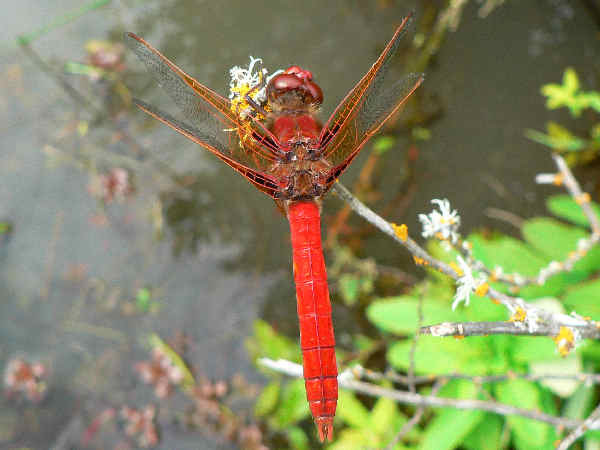 While it shares these features with the Flame Skimmer, Cardinal Meadowhawks also rest with their wings pointed forward. The single spot on each wing along with white stigmas serve as the most useful field ID clues for the Four-spotted Pennant (Brachymesia gravida). 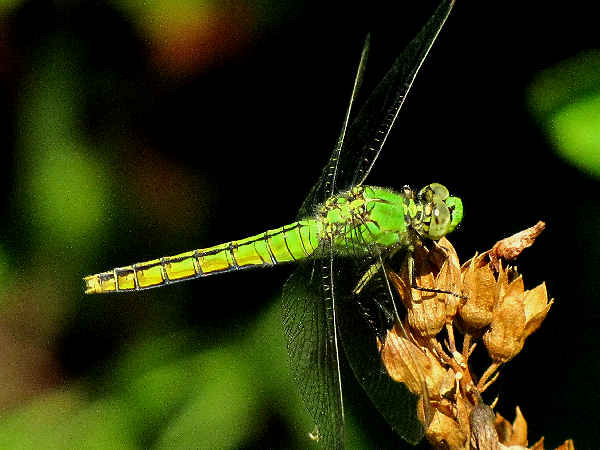 Novice dragonfly enthusiasts need not worry about how to go about learning to identify the high number of native dragonfly species. Time, patience and dedication to the work is really all that is needed to catch on. 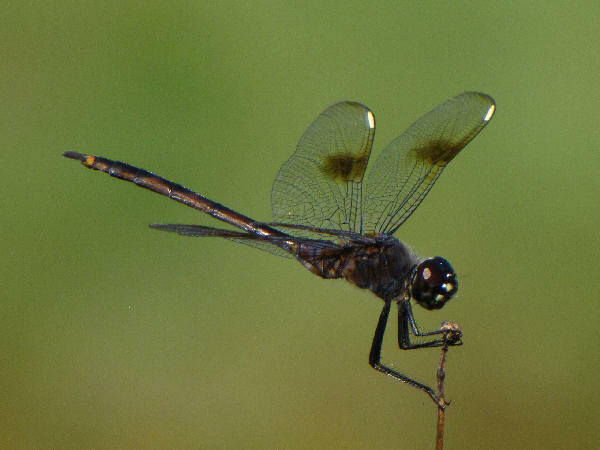 The More Skimmers button and Neotropical Skimmers button provide pictures and information to help with skimmer dragonfly identification for about six to nine additional genera of skimmers. 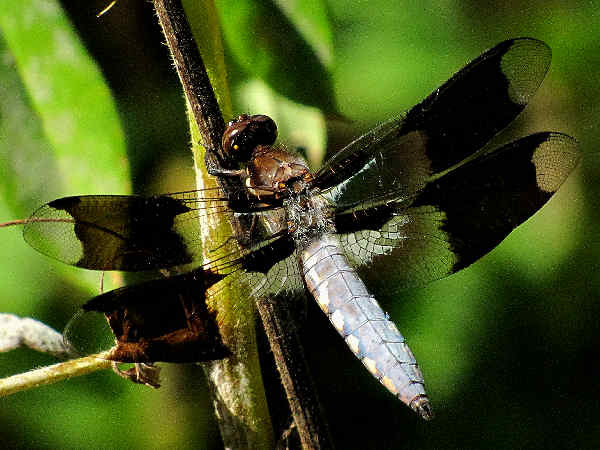 Before going there, consider the fact that everyone is a dragonfly identification expert by starting with the three most common dragonfly species in the United States. They fit into three different genera and start with the Common Whitetail, pictured above. The name Common White is no exaggeration. 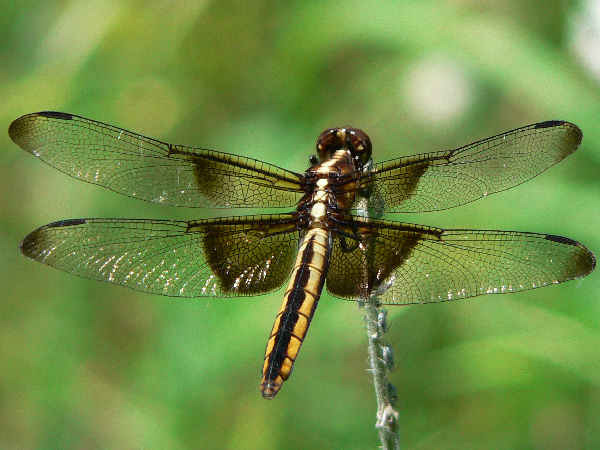 Along with Pondhawks and Dashers, the Common Whitetail is probably one of the three most common dragonflies in the United States. The picture shows a female. Males develop a white covering over the abdomen as they mature. The yellow stripes on the side of the abdomen of the female help differentiate it from he Eight Spotted Skimmer. There is another species in the genus, the Desert Whitetail. Pondhawks also rand as very common dragonflies. The discussion about whether to list the Eastern and Western Pondhawks as a single or separate species continues. In both species mature males have a blue body and green face. The cerci, or tip of the abdomen is white. 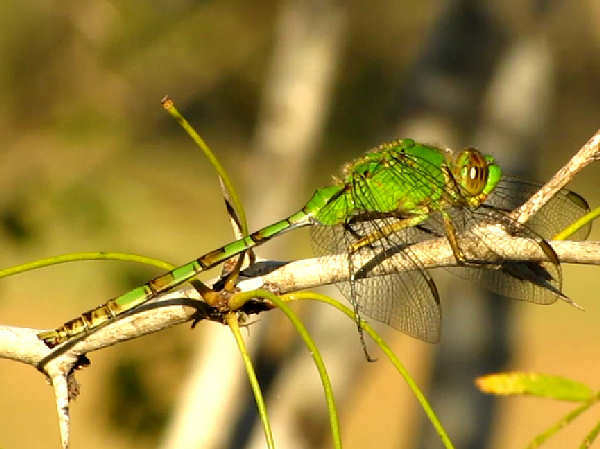 Female Eastern Pondhawks have green bodies with dark markings on the abdomen. Compare the female Western Pondhawk with the female Eastern Pondhawk and it sure looks as if you are looking at two different species. Western species have a dark line down the abdomen. Male Western Pondhawks look similar to the male Eastern Pondhawks. The Cerci or tip of the abdomen is a darker color. In some areas where the two species overlap, they do hybridize. 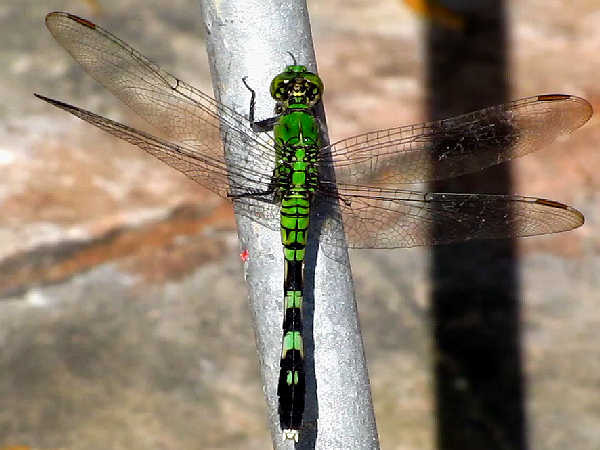 The Great Pondhawk (Erythemis vesiculosa) might not fit the everyone can be a dragonfly identification expert because of its limited range. They live along southern border areas. Males and females look similar, although the male has darker markings on the abdomen between the green markings. The thorax is a bright lime green. Skimmer dragonfly identification can be a bit less overwhelming when one realizes that about forty percent of the species fit into two or possible three different genera. The twenty nine genera of skimmer dragonflies sounds like a large number upon first hearing it. However, eleven of the twenty nine genera have exactly one species recorded in the United States. 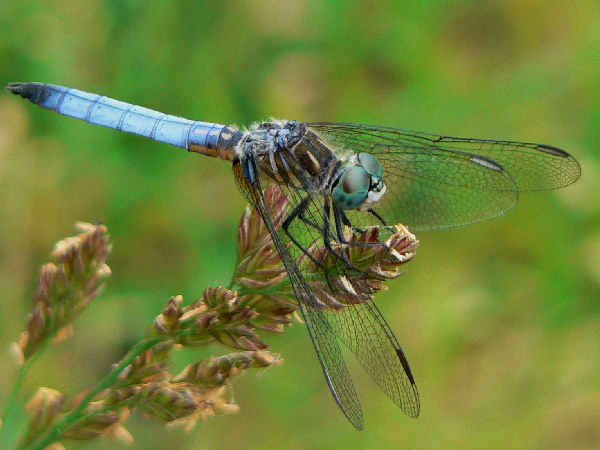 The everyone can be a dragonfly identification expert section spills over to the one hit wondersm the Blue Dashers (Pachydiplax longipennis). They are the only representatives of the Pachydiplax genus. 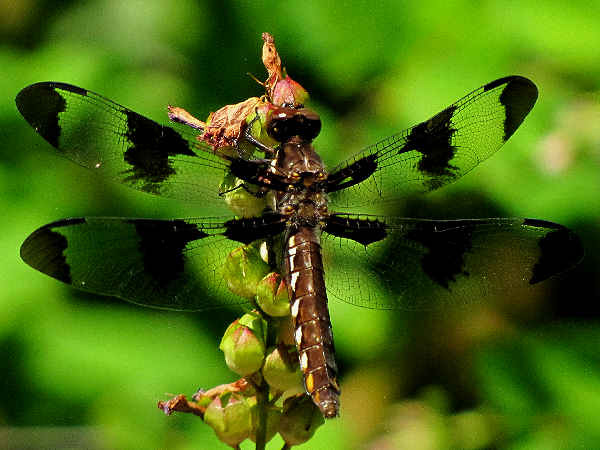 Nonetheless, they also rank as one of the most ubiquitous dragonflies in the United States. They are literally everywhere areound ponds and other slow moving water areas. Mature males, such as the one pictured at the top of the section, have a blue body. In some instances they might be mistaken for the blue male Pondhawk. As the picture highlights male Blue Dashers have stripes on the thorax. Female Blue Dashers are a rather indescript brown color with yellow to cream color stripes on both the thorax and down the abdomen. 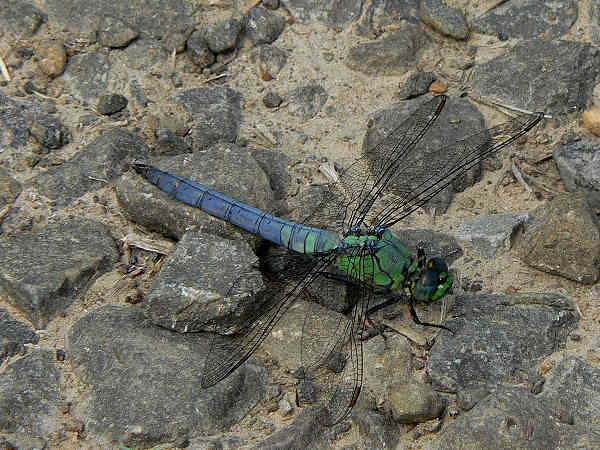 The remainder of the one hit wonder dragonflys may not be so easy to identify given the fact that their range is limited. Five species of Scarlet-tails inhabit areas of South America and Mexico. 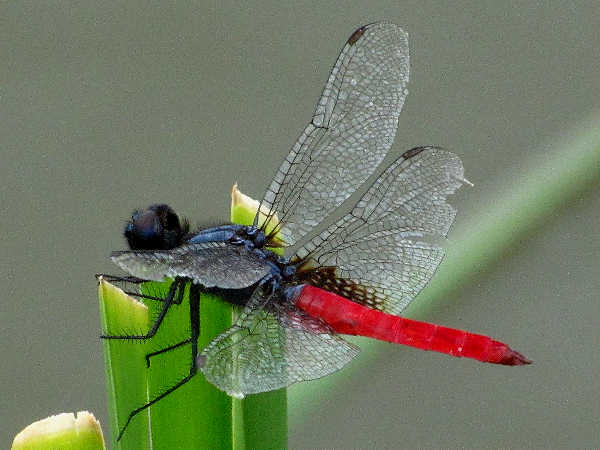 It was with great joy in 2008 that a dragonfly enthusiast in the Lower Rio Grande Valley of Texas spotted a Mexican Scarlet-tail (Planiplax sanguiniventris) flying and perching in the area. Since then, visitors with a keen eye can spot and photograph one. 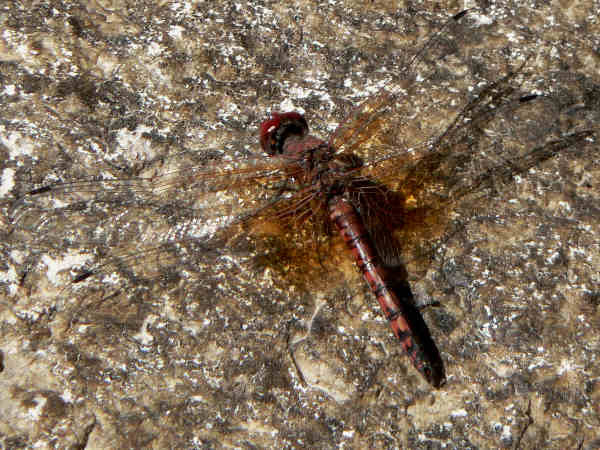 Red Rock Skimmers (Paltothemis lineatipes) can often be found on rocks along stream areas of the Southwest. Females are a fairly dull brown color with a lighter brown design on the abdomen. Male Red Rock Skimmers are a bit brighter looking with the red coloration on the abdomen. Hyacinth Glider (Miathyria marcella), the sole member of the Miathyria genus, inhabit areas across the Golf Coast.